This might sound like a very basic and unnecessary tip but I assure you, after 4 years it is one you might wished you had paid heed to. Many softwood panel fences are erected every year at considerable expense to the home owner. Unfortunately, a high percentage of these fences will need to have their posts replaced after as little as 4 years - sometimes less if the softwood that the fence and posts are made of is of low quality or they have not been pressure treated to the right standard. A problem often arises when a fence post is set completely into concrete. 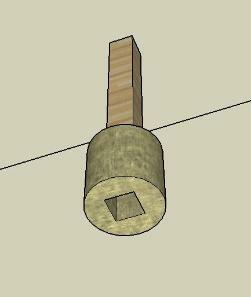 This effectively forms a cup at the base where water, that runs down the outside of the post, collects around the end of the post and has no way to get out. With the post sitting permanently in water the wood rots very very quickly leading to premature weakness. The post can break during strong winds which it would normally cope with easily. Of course, if all of the posts are put up on the same day you could be faced with having to re-place the lot at the same time. Click on the image and you will see that the post is allowed to extend through the concrete into the soil so that any water will never be trapped and can drain away before it becomes a problem. If you have a clay soil that might make drainage harder then dig your post hole an extra 100mm deeper than you need, fill this with ballast (no cement) and then tamp down with the end of the post. Now insert your post and concrete around the sides only. The ballast acts as a soak-away (to an extent) . Normally, if the bottom of your posts - providing they are of good quality - should last 10-20 years. One last tip regarding posts. After a year or so, the fence posts will often shrink in their concrete sockets ever so slightly. If you want to preserve the wood that little longer, trickle some water based preservative down the face of the post so that it finds it's way into the wood below ground thus helping to preserve the submerged wood that little longer. Concrete mix - I am sure you have all heard that if you mix your ballast with your cement creating a dry mix and then back-fill your hole with this 'drylene' mixture the surrounding moisture will activate the mix and cause it to set 'concrete' hard? I believe this method is flawed and all too often not strong enough to do a proper log term job. My advice would be to mix the all-in aggregate with ordinary Portland cement at a ratio 4:1 with enough water that will thoroughly mix to bind the material but will not slump or run. A fence post will stand up unaided until the concrete goes off leading to a much stronger job. thanks! confirming my suspicions about 'no cup' concreting. glad to know a philosopher can grasp such things with reason and good thinking. who woulda thunk it? I wonder if the whole post in concrete thing is really the best way forward? The farmers where I live don't like throwing money around and never use concrete for their fence or gate posts. They just use rammed earth with zero drainage issues. If that didn't stand the test of time they would change their methods. My local fencing contractor uses this practice too, he does lots of the farm and estate fences in the area. i like my post with extended concrete running downwards and bottom of post and concrete muff painted in bitchhumen paint. the opposite is a cup, the water collects in around the top of the post and thats where they rot very quickly. If you don't want to mix concrete and ballast but are wary of just forcing the fence posts into the ground then postfix is a good option. I personally dont like timber posts and prefer concrete ones. I would agree with chorley, having shingle in the bottom will make the post last longer.. and help with drainage. Over twenty years ago, I put up fence posts from a well-known company with a 25year guarantee by just filling around them with concrete. They are still there. Not all fence posts are created equal. At least an extra 100mm all round Pat (150mm for extra security). I am putting in two 6X6 posts for a zip line in our yard. One post will have 4' in the ground, so 11 ft about ground, and the other will be 4' in the ground with 8 feet above ground. How big around the post should be concrete be? I have a river bank that I want to erect a retaining fence with concrete posts and sleepers to support the bank how do I concrete posts in as aproximately 2 feet down I am at water level any ideas. Excellent post on Mortar Mix consists of a uniformly blended mixture of portland cement, commercial grade sands and other approved ingredients.Cement is made by heating a finely ground mixture of clay and limestone, and water, to a temperature at which the clay and limestone fuse into a clinker. The clinker is ground to a fine powder called cement. I had real problems with the posts rotting off at ground level. I had to break away the concrete every time in order to reset a new post. It became very regular, very time consuming, very expensive and hard work. I had a long, panelled fence and ended up replacing a post every fortnight or so. Clearly I had to find a solution. It is so easy. Simply remove the old concrete and stump. Then concrete a new post in position BUT first increase its size by pinning on hardboard or something similar to the length of post which is going to be in the ground. Wrap the bottom in 2 or 3 layers of polythene (supermarket plastic bags are perfect). Once the concrete has set or even just after it has hardened gently lift out the post. It will come out because of the lack of friction between the plastic bags. You now have a concrete socket slightly oversize and you can easily lift in a new post. This is even better than a solid post since the slight "give" reduces the force of the wind on the fence. Since the post is not a tight fit water drains down the post below ground level and they last for years. Even if they do eventually break it is simply a case of lifting out the broken stump and slotting in a new post. I am 77 years of age and mending my fence now holds no terrors for me. I wonder to saw this posting on the concrete render which is mostly related to the Concrete Curing Compound.This is help to provide the good lookup and strong mechanism for the concrete. How simple and effective. Excellent advice. 1.First set posts in concrete. 2. Then prepare fence posts. 4. after that add inches of gravel. 6.Repeat for each post hole. I think that a clean concrete slab looks so nice and professional with buildings. Even at a home, it looks so clean! I love having a little bit of concrete in our yard because it gives the kids a lot more options of things to play and do. The great thing about the experience of building a good fence is that it helps a lot when I'm looking for a fence for myself.